Yes, you and your family can enjoy the outstanding Cincinnati Zoo & Botanical Gardens for only $1 on July 21 from 9am-6pm. 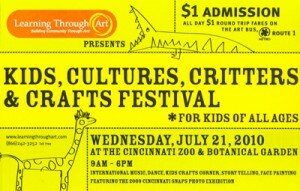 Learning Through Art is hosting their 5th annual, Kids Cultures, Critters & Crafts Festival at the Zoo. Yea for all of us. This event is jam packed with fun things to do for kids. Of course, top on the list is seeing all the animals, but you’ll also enjoy lots of cultural entertainment, musical guests, dancing, face-painting, crafts and more. The Amazing Portable Circus will be there and you can also see Zak Morgan perform. They have so much packed into one day, that you won’t want to miss this fun event. As an added bonus, if you live near any of the bus routes, you can hop aboard The Art Bus Route with Metro for only $1 round/trip and there will be entertainment on the bus to keep you smiling. You can visit Metro to find out where to hop aboard Route 1. 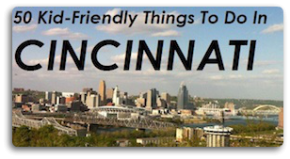 LTA says it best on their website, “Join Learning Through Art as we build bridges, break down barriers to bring neighbors and neighborhoods together to celebrate the mosaic beauty of our region.” Thanks to Macy’s for sponsoring this event and to the Cincinnati Zoo for hosting the venue. There are many other wonderful organizations that help make this all possible, and if you click here, you can read more.